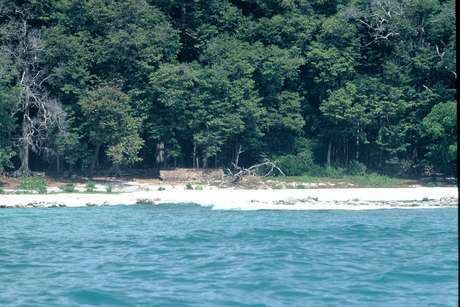 The Sentinelese are an uncontacted tribe living on North Sentinal Island, one of the Andaman Islands in the Indian Ocean. They vigorously reject all contact with outsiders. Survival International lobbies, protests and uses public pressure to ensure their wish to remain uncontacted is respected. If not, the entire tribe could be wiped out by diseases to which they have no immunity. 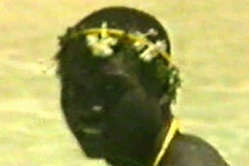 The Sentinelese are the most isolated tribe in the world, and have captured the imagination of millions. They live on their own small forested island called North Sentinel, which is approximately the size of Manhattan. They continue to resist all contact with outsiders, attacking anyone who comes near. 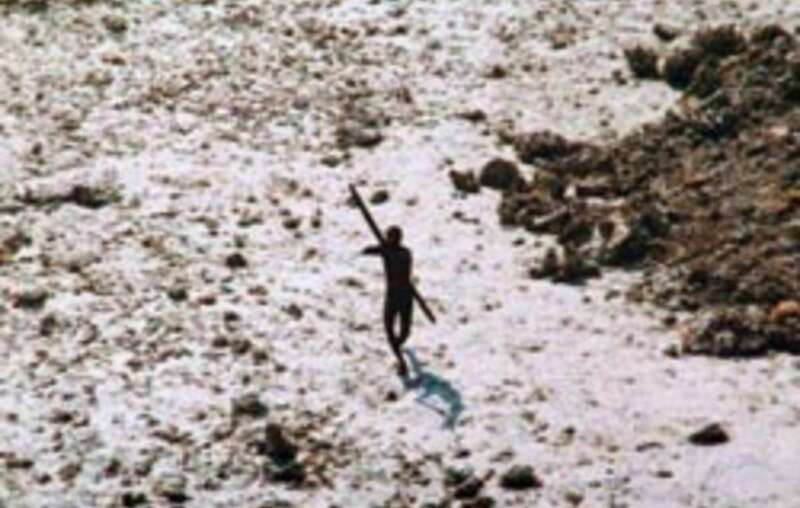 In the wake of the 2004 tsunami this member of the Sentinelese tribe was photographed firing arrows at a helicopter. 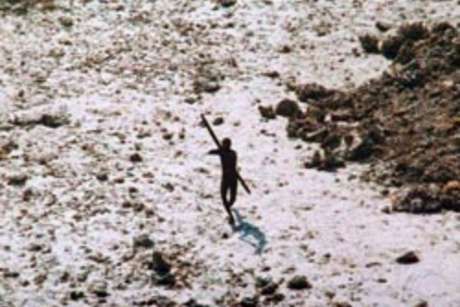 In November 2018, John Allen Chau, an American man, was killed by members of the Sentinelese tribe. In 2006, two Indian fishermen, who had moored their boat near North Sentinel to sleep after poaching in the waters around the island, were killed when their boat broke loose and drifted onto the shore. Poachers are known to fish illegally in the waters around the island, catching turtles and diving for lobsters and sea cucumbers. The tribe have made it clear that they do not want contact. It is a wise choice. Neighboring tribes were wiped out after the British colonized their islands, and they lack immunity to common diseases like flu or measles, which would decimate their population. 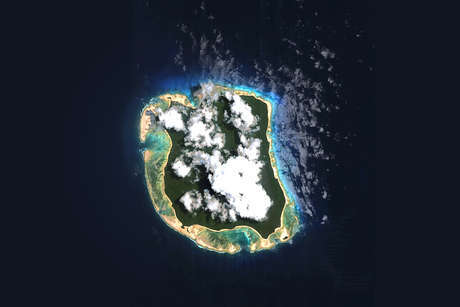 North Sentinel Island, home of the Sentinelese, as seen from above. Most of what is known about the Sentinelese has been gathered by viewing them from boats moored more than an arrows distance from the shore and a few brief periods where the Sentinelese allowed the authorities to get close enough to hand over some coconuts. Even what they call themselves is unknown. The Sentinelese hunt and gather in the forest, and fish in the coastal waters. Unlike the neighbouring Jarawa tribe, they make boats – these are very narrow outrigger canoes, described as ‘too narrow to fit two feet in’. These can only be used in shallow waters as they are steered and propelled with a pole like a punt. 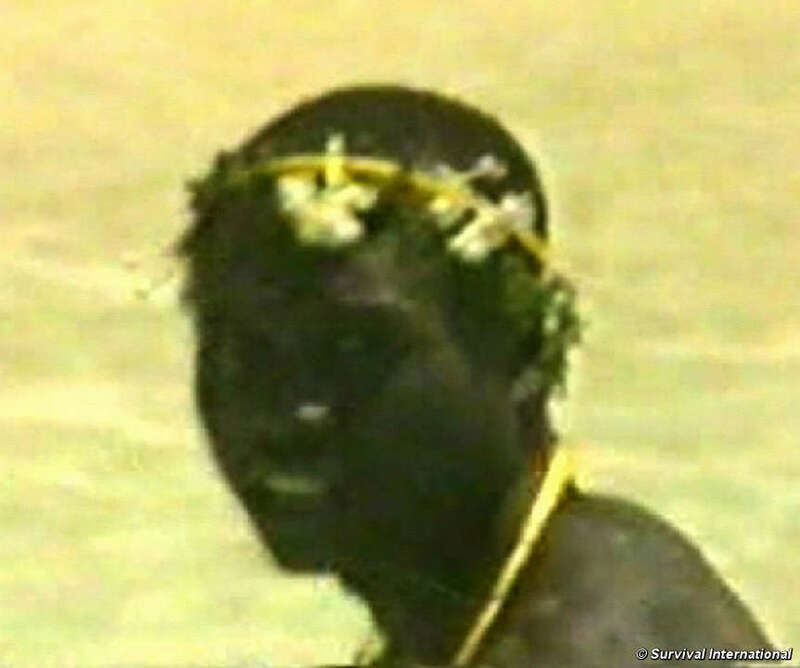 It is thought that the Sentinelese live in three small bands. They have two different types of houses; large communal huts with several hearths for a number of families, and more temporary shelters, with no sides, which can sometimes be seen on the beach, with space for one nuclear family. The women wear fibre strings tied around their waists, necks and heads. The men also wear necklaces and headbands, but with a thicker waist belt. The men carry spears, bows and arrows. Although commonly described in the media as ‘Stone Age’ this is clearly not true. 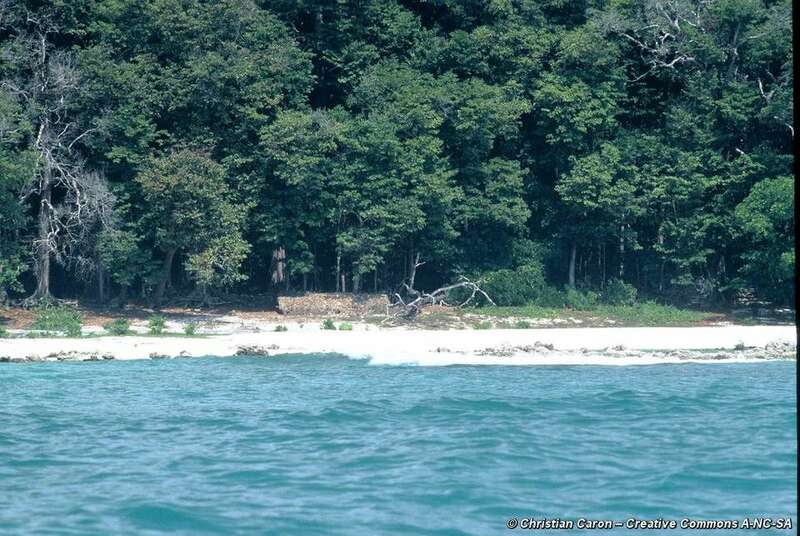 There is no reason to believe the Sentinelese have been living in the same way for the tens of thousands of years they are likely to have been in the Andamans. Their ways of life will have changed and adapted many times, like all peoples. For instance, they now use metal which has been washed up or which they have recovered from shipwrecks on the island reefs. The iron is sharpened and used to tip their arrows. 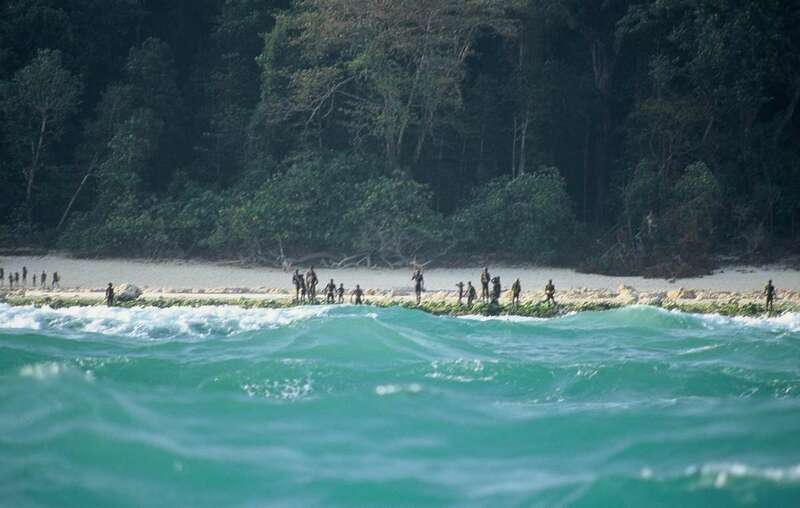 From what can be seen from a distance, the Sentinelese islanders are clearly extremely healthy and thriving, in marked contrast to the Great Andamanese tribes to whom the British attempted to bring ‘civilization’. The people who are seen on the shores of North Sentinel look proud, strong and healthy and at any one time observers have noted many children and pregnant women. 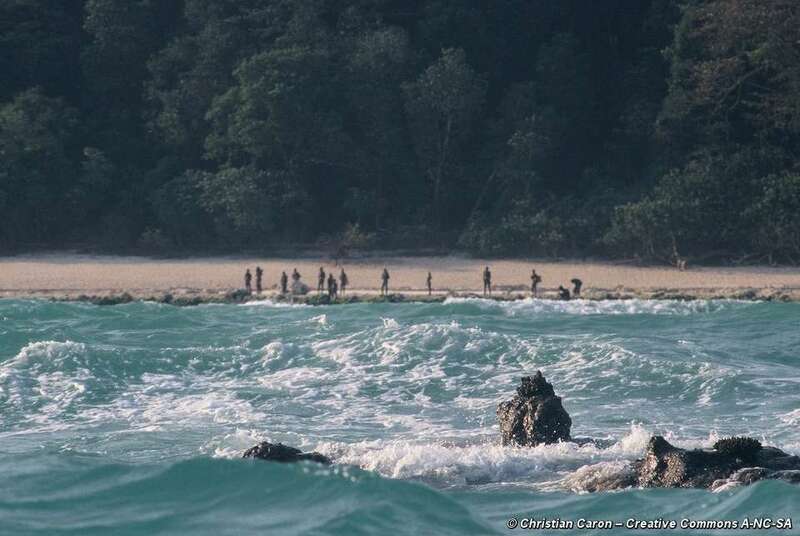 They attracted international attention in the wake of the 2004 Asian tsunami, when a member of the tribe was photographed on a beach, firing arrows at a helicopter which was checking on their welfare. 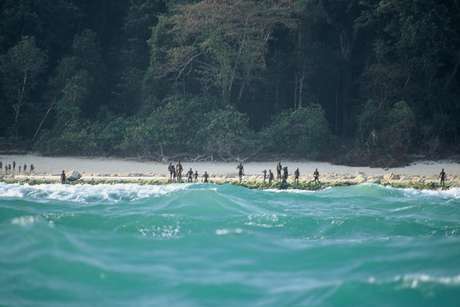 The Sentinelese stand guard on an island beach. In the late 1800s M.V. Portman, the British ‘Officer in Charge of the Andamanese’ landed, with a large team, on North Sentinel Island in the hope of contacting the Sentinelese. The party included trackers, from Andamanese tribes who had already made contact with the British, officers and convicts. They found recently abandoned villages and paths but the Sentinelese were nowhere to be seen. After a few days they came across an elderly couple and some children who, ‘in the interest of science’ were taken to Port Blair, the island’s capital. Predictably they soon fell ill and the adults died. The children were taken back to their island with a number of gifts. 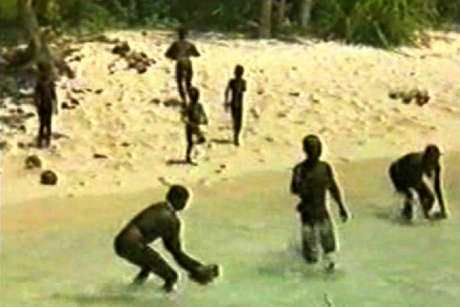 It is not known how many Sentinelese became ill as a result of this ‘science’ but it’s likely that the children would have passed on their diseases and the results would have been devastating. It is mere conjecture, but might this experience account for the Sentinelese’s continued hostility and rejection of outsiders? During the 1970s the Indian authorities made occasional trips to North Sentinel in an attempt to befriend the tribe. These were often at the behest of dignitaries who wanted an adventure. On one of these trips two pigs and a doll were left on the beach. The Sentinelese speared the pigs and buried them, along with the doll. Such visits became more regular in the 1980s; the teams would try to land, at a place out of the reach of arrows, and leave gifts such as coconuts, bananas and bits of iron. Sometimes the Sentinelese appeared to make friendly gestures; at others they would take the gifts into the forest and then fire arrows at the contact party. In 1991 there appeared to be a breakthrough. When the officials arrived in North Sentinel the tribe gestured for them to bring gifts and then, for the first time, approached without their weapons. They even waded into the sea towards the boat to collect more coconuts. However, this friendly contact was not to last, although gift dropping trips continued for some years, encounters were not always friendly. 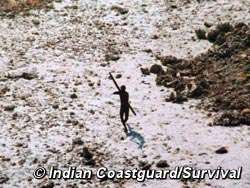 At times the Sentinelese aimed their arrows at the contact team, and once they attacked a wooden boat with their adzes (a stone axe for cutting wood). No one knows why the Sentinelese first dropped, and then resumed their hostility to the contact missions, nor if any died as a result of diseases caught during these visits. In 1996 the regular gift dropping missions stopped. Many officials were beginning to question the wisdom of attempting to contact a people who were healthy and content and who had thrived on their own for up to 55,000 years. Friendly contact had had only a devastating impact on the Great Andamanese tribes. Sustained contact with the Sentinelese would almost certainly have tragic consequences. In the following years only occasional visits were made, again with a mixed response. After the Tsunami in 2004, officials made two visits to check, from a distance, that the tribe seemed healthy and were not suffering in any way. They then declared that no further attempts would be made to contact the Sentinelese. 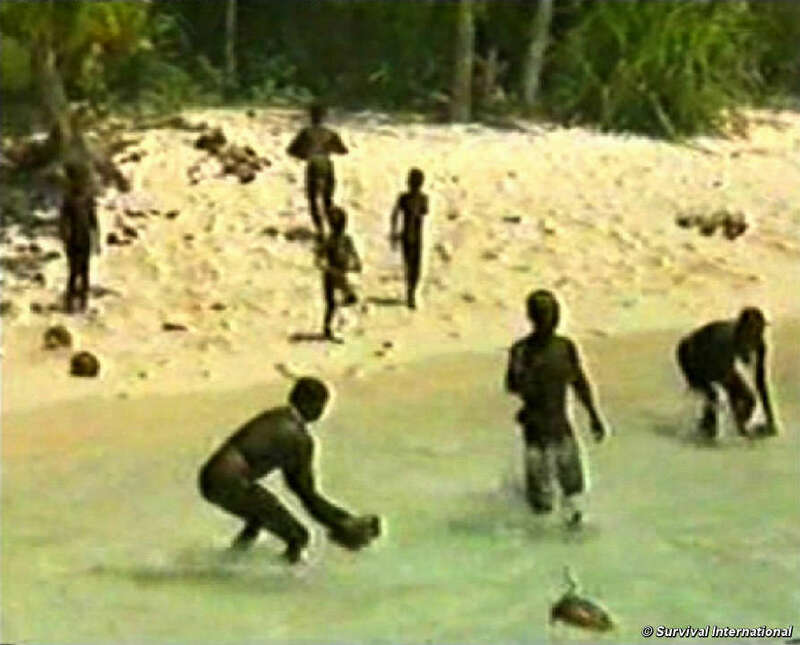 Footage from one of many government attempts to establish contact with the isolated Sentinelese by fostering a dependence on outside gifts such as coconuts. After protests by Survival and local supporters, such contact trips have officially stopped, as they put both parties at grave risk. Their extreme isolation makes them very vulnerable to diseases to which they have no immunity, meaning contact would almost certainly have tragic consequences for them. 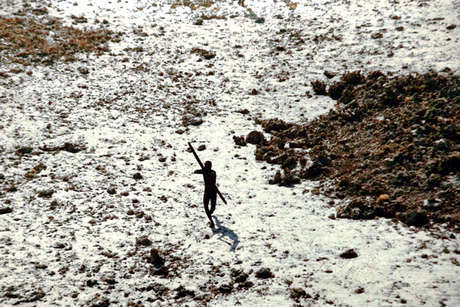 Following a campaign by Survival and local organisations, the Indian government abandoned plans to contact the Sentinelese, and their current position is still that no further attempts to contact the tribe will be made. Periodic checks, from boats anchored at a safe distance from shore, are made to ensure that the Sentinelese appear well and have not chosen to seek contact. 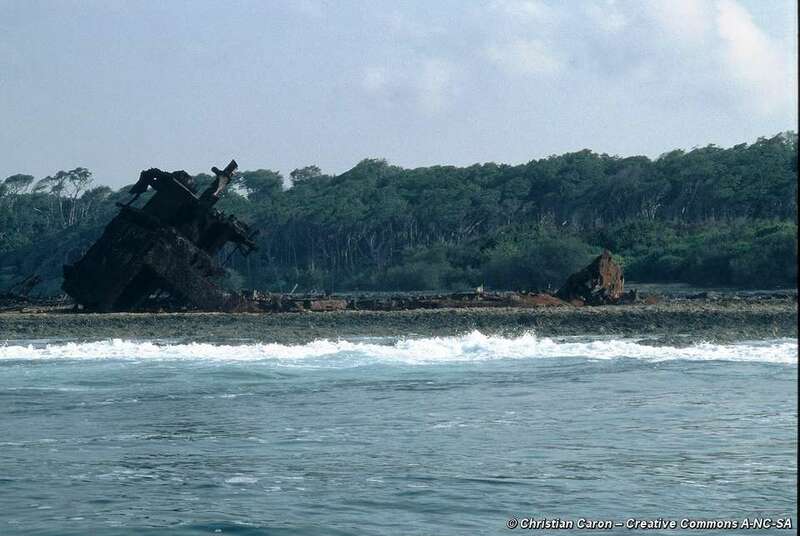 Survival’s work for the Sentinelese focuses on pressuring India to stop illegal poaching in their waters, and ensuring officials maintain their policy of no contact. Your support is vital for the survival of this uncontacted tribe. There are lots of ways you can help.